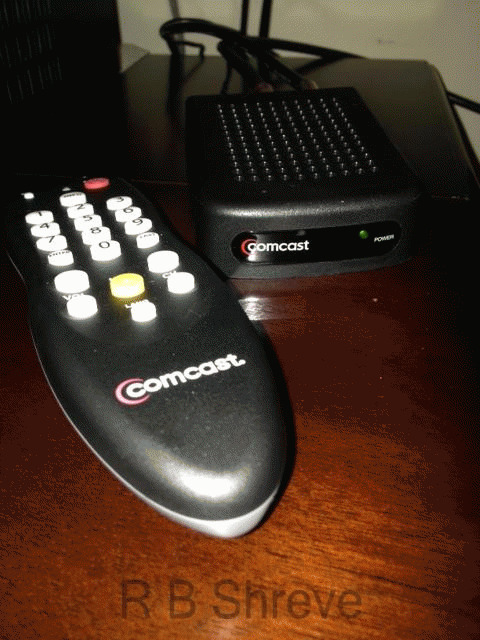 In the Newtown, PA area and elsewhere across the nation Comcast subscribers are no longer able to use their digital ready TV sets to view the basic TV channels without a set-top box. Now these channels are all scrambled, and the only one that can be viewed is a continuous loop that has friendly guy in a red polo shirt that tells viewers that if their TV will no longer pick up the other channels, they need to get the "free" Comcast DA converter to unscramble the encrypted basic channels. The box (photo) is indeed free, but only two of them per account, and only free for a limited time. There is a serious loss of video quality. The DA converter puts out an analog signal (think poor color and blurry like your VHS tapes) to the TV's conventional tuner. So now, if you want to see crisp digital high definition images, you must pay for the set top box even if you never intend to buy any of the premium programming it is capable of delivering. The rented box provides video directly to the higher definition input(s) of your TV for the vibrant color and crispness you bought a flat screen to see. Some consumers are shunning Cable TV and getting their entertainment video via the internet. But if you have been reading the news, your internet sources of video entertainment are under attack by the cable giants as well. The FCC is presently considering a two tier system of internet streaming where content providers like Netflix pay a premium to get higher speed delivery. (Netflix already is paying such a premium.) Those costs must necessarily show up at the consumer level. We can expect that there will be a play by Comcast to limit the speed of your home connection as well. The technology is already in place as I discovered accidentally when I moved recently. I set up an old cable modem that I had once used for internet at my old home in my new home and plugged it in. It had been on the shelf for a year because I purchased the Comcast triple-play system that includes phone service. To my surprise it worked without a call to Comcast. That old modem was blazing fast, faster by a factor of three in my new home than my former location. Evidently Comcast failed to de-register it and it worked at my new apartment because the landlord provides basic cable to all tenants. Once I was moved in I called Comcast to update the billing on my account. They were surprised that my modem already worked in the new location -- evidently they failed to de-register it when I bought the triple-play package for my old home. They explained that they couldn't update the account, but would have to close it and establish a new account. (Lots of things got screwed up as they went through that process, but that's another story.) After a number of tech support calls the old account was closed and the new one was established. But the speed of the internet connection on my modem dropped dramatically after it was registered to my new account. Obviously Comcast is artificially limiting the internet bandwidth to my modem. As a rogue it was blazing fast, but once bridled it became tamed and runs at a gated pace. It's their network. I presume they have the right. And I imagine that if I called and wanted more speed, I could buy premium service and they would loosen the reins a bit and let it cantor or gallop again. Cable TV, like other utilities, is a legal monopoly. It is and should be regulated for the benefit of the consumer. Only one carrier gets to wire a town. We don't have an alternative like Verizon FIOS from Verizon here where I live, and that probably would not really be competition if we did since all the carriers are motivated by the desire to up revenue. Unless the FCC gets a regulatory handle on this, the days of internet neutrality and open access are numbered. "[The FCC] should decide to classify broadband as a telecommunications service, which would allow it to prohibit companies like Verizon and Comcast from engaging in unjust or unreasonable discrimination. (The F.C.C. classified broadband as a lightly regulated information service during the George W. Bush administration. )," say the editors of the NY Times. You, dear internet lover, should check out Creating a Two Speed Internet in the NY Times and then you should let congress and the FCC know you don't like where this is all going.